Perhaps it’s SEO’s “Oreo moment,” a tweet relating to search engine optimization that’s gained nearly as much attention as Oreo’s famous Super Bowl blackout tweet. But the subject was a perfect storm of goodness — a real-life example of Google doing the type of thing in search it seems to be telling others not to do. Yesterday, the head of Google’s web spam team Matt Cutts announced a new Google Scraper Report for publishers to use if they see a site that has copied or “scraped” its content and which outranks the publisher in Google searches. It was super clever. 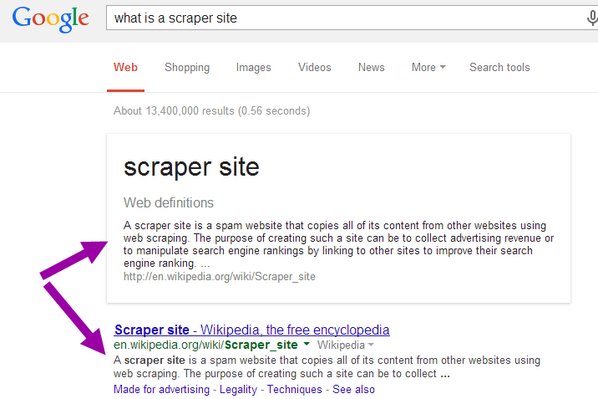 Barker did a search for what is a scraper site, which brought up Google’s own web definition at the top of the results. And that definition technically outranks the original source of the content, Wikipedia, which comes right below. Google does link to Wikipedia in its excerpt, which is in keeping with how its other search results work and generally on the right side of the law, when these things have been challenged in various places. And by scraper site, Google’s really talking about sites that wholescale copy all of someone’s content, rather than aiming for a fair use excerpt. But still, as Google has increased the amount of web definitions, direct answers andKnowledge Graph box answers that are drawn from the content of other sites, the tensions have been rising. With regular search listings, Google typically showed enough information for a searcher to decide if they want to visit a website and, if so, they’d click through. But the changes over the past few years (which Bing also does) have been to provide actual answers drawn from sites, so that there’s no need to click through. It’s a difficult balancing act, because there are good reasons why it makes more sense for Google (or Bing) to just show the direct answer of something, rather than having dozens of sites all fight to be number one for “What time is the Super Bowl,” as they do. But, it’s also a fundamental change to the unwritten contract between search engines and publishers — that yes, search engines can build their “content” on the back of publisher content, but only if there’s a fair exchange of traffic. Barker’s tweet is perhaps the biggest sign ever that publishers are feeling like the balancing act is tipping too much into Google’s side. I’ve never, in 18 years writing about search, seen such a response like this. Last year’s Oreo tweet, when the Super Bowl had a blackout, was a darling example of huge engagement. That tweet, associated with a prime time event, has about 16,000 retweets as of today, over a year later. Barker’s tweet, not associated with any major sporting event and about an issue that’s usually only of concern to SEOs, is over 14,000 tweets as I write this — and over 12,000 favorites.